Tom Douglas has added three new eateries to his already impressive lineup of restaurants. 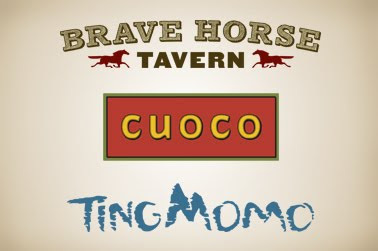 Brave Horse Tavern, Cuoco and Ting Momo are all located in the up and coming neighborhood of South Lake Union in Seattle. All three are located in the historic Terry Avenue Building in the heart of Amazon.com's new campus. Brave Horse Tavern has 24 taps, handcrafted pretzels, and burgers. Cuoco is an Italian restaurant with house made pasta. Ting Momo offers Tibetan dumplings with a twist. All three are now open. I hope to be able to try all three soon to offer up a review of each.